e of the many ziplining spots around the island where you can experience a unique mix of sights, sounds, and delights! Many zipline businesses are run by experts who can answer any questions you might have about the island. They are certified to keep you and your family safe with up-to-date equipment and properly maintained structures. From the beautiful ocean view in Rodney Bay to the dark green rainforests surrounding Soufriere Volcano, you won’t run out of sights to see in Saint Lucia! When you prepare for a zipline adventure tour in Saint Lucia, there are certain requirements you need to take in consideration. Many tour guides have a dress code requirement for ziplining. For example, shoes are often mandatory. You can not wear high heels, flip flops, or sandals when you go ziplining. 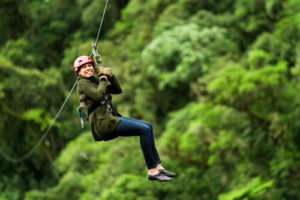 Some ziplines come with sharp starts and stops, so visitors who have a history with neck or back problems may want to avoid going on this particular tour. Women who are pregnant should consult with a medical expert before ziplining. Because most tours involve a short hike to the first zipline, make sure you pack some water and a light snack with you! A hat can also protect you from the sun during the hotter summer months. Make sure you have somewhere to store your belongings – like a backpack. At Dave Charles Taxi Service, a professional, local tour guide can safely drive you to your destination. Avoid the headache of getting lost in unfamiliar streets with a guide that has years of experience working with tourists and locals. With our services, you get the privilege of first-hand knowledge of Saint Lucia’s history, wildlife, and culture that you can’t learn anywhere else! Break away from the typical vacation routine and experience a zipline adventure tour you can only find in Saint Lucia. Start your adventure in paradise today – contact us to learn about rates, reservations, and recommendations for your trip!